SoloPower, a CIGS thin-film solar firm looking to build flexible PV panels, is closing a factory and pulling back from its ambitions of building hundreds of megawatts of PV in Portland, Oregon. The firm is a recipient of significant venture capital and state subsidies, as well as a $197 million DOE loan guarantee which has not yet been used. SoloPower's new CEO Rob Campbell announced earlier this week that the firm was suspending its Portland manufacturing facility, as reported in Oregon Live. Reports have Campbell saying he is trying to attract capital and restart full operations. Layoffs will affect more than 25 employees in Oregon. Greentech Media has learned that the San Jose, California operations have been reduced to a skeleton crew as the company looks for a buyer. This is a similar situation to that faced by Nanosolar and a number of other thin-film solar firms. Sources close to the company said that the firm had customers willing to pay a premium for the lightweight, flexible solar product -- but not enough to keep a factory humming. A few Chinese firms have been "kicking the tires" at SoloPower, according to the source. SoloPower was going after the same rooftop market as Ascent Solar, Global Solar, and the now-bankrupt ECD, except it was doing it with a more efficient product. The value proposition for flexible modules from SoloPower is that there is less hardware required to install the modules and the installation is easier and less expensive. However, this thesis has yet to be proven in volume and scale. 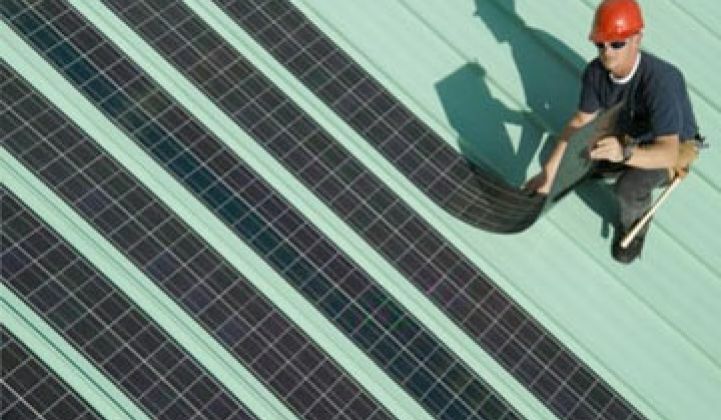 The other alleged advantage of flexible CIGS solar panels is that their lightweight nature opens up "value-engineered" rooftops that could not support the weight of conventional crystalline solar panels. This thesis also remains to be proven. Solar panels manufactured in the CIGS thin film materials system have long held the promise of high efficiency at low costs, but have yet to deliver -- despite billions of dollars invested by venture capital investors. Solyndra is the most prominent failure, but other CIGS companies like AQT have faltered as well. CIGS firms HelioVolt and Ascent Solar gave over their firms to Asian conglomerate SK Group and TFG Radiant Group, respectively. Nanosolar is for sale and MiaSolé was sold to Hanergy. There are going to be fevered comparisons to Solyndra, but SoloPower did not draw down DOE loan funding -- although it did receive about $14 million in state subsidies. Solyndra spent a $535 million DOE loan and received about $700 million in private equity. SoloPower raised more than $200 million from Hudson Clean Energy Partners, Crosslink Capital, Convexa, and Firsthand Capital.